The VDA-4 has the same features, performance and specification as the MicroDA, but in an enclosure that can be for either table top use or rack mounted using the optional RM-4. There is a rear panel switch to select an internal 75 Ohm termination resistor on the loop through input. 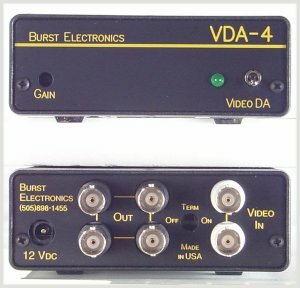 Options: Rack mount, S-video (Y/C) Version (Model VDA-4YC). Size: 4.2 W x 1.5 H x 5.5 D inches.